Moose are a common sight in Big Sky, Montana. You might spot a moose on your way to pick up a cup of coffee in Town Center, while walking your dog in West Fork, bedded down in the willows by the golf course when you’re about to tee off, eating shrubbery near your favorite hiking trail, on the way to the slopes at Big Sky Resort, or walking down the side of Highway 191. If you spot one, definitely snap a photo from a distance, but always give wild animals the respect they deserve. Moose are the largest member of the deer family. They are distinguished by size and by flat (palmate) antlers on males. Moose are ungulates (hoofed mammals). Moose are herbivores. They eat easy to reach willow, birch, aspen leaves, twigs, and other similar food. Male moose are called bulls. Female moose are called cows. The flap of skin under a moose’s throat is called a bell. Cows select mates based on antler size. Antlers are broad and palmate (flat) with tines (points). The widest antler spread ever recorded was 210 centimeters across! Bulls drop antlers after mating season to conserve energy in the winter. Then the antlers grow back over 3 to 5 months starting in the spring. Mating season is in September and October. Males will breed with multiple females. Females can give birth to one or two calves in May or June. The babies stay with the mother until the next calves are born the following year. Calves weigh 30 pounds at birth. They can outrun a human within five days. Moose can live 15-20+ years. The average moose is 4.6 – 6.9 feet high at the shoulder. They are typically 7.9 to 10.2 feet long. Moose are the tallest mammals in North America. Bulls usually weigh between 838 to 1543 pounds. Cows usually weigh 441 to 1080 pounds. Predators include wolves, black bears, and brown bears. Moose attack more people than bears and wolves combined. In the Americas, moose injure more people than any other wild animal. Worldwide, only hippopotamuses injure more people. In the northern hemisphere moose live in places like Alaska, Canada, New England, Asia, Europe, and of course Big Sky, Montana! Globally there are about 1.5 million moose. It is estimated that there around 300,000 moose in the US. Moose hair is hollow to help insulate and keep them warm from the cold. Moose can run 35 MPH. Moose lay down to sleep and rest. 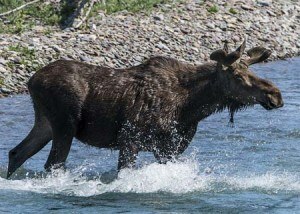 Moose can swim up to 12+ miles at 6 MPH and stay underwater for 30 seconds. Moose can eat up to 73 pounds a day in the summer and about 34 pounds in the winter. Moose prefer to live in the forests, wetlands, clear cuts, river valleys, and mountain meadows. In Montana, Moose hunting season is usually mid September to the end of November. A permit must be obtained from Montana Fish, Wildlife, & Parks. 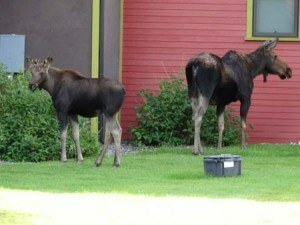 We’re pretty lucky in Big Sky, Montana that we share our home and our backyard with moose and other wildlife. But remember, that Big Sky isn’t Disneyland. Never approach a moose. Moose can be highly unpredictable. While they are usually sedentary animals, they can can quickly and unexpectedly become aggressive. Moose are active in the Big Sky area all year long. Things like people, dogs, or even traffic can set them off. ALWAYS give them plenty of space.